Opossums attract and then kill thousands of ticks per acre, per week, making them one of our best allies in stopping the spread of Lyme disease, researchers say. A study compared squirrels, mice and opossums, which all eat ticks, and found opossums were the most effective exterminators. Ticks favor opossums twice as much as the other rodents, the researchers, from Syracuse University, found. 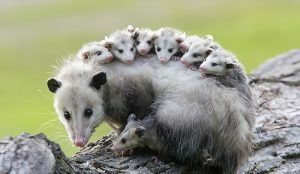 Fortunately, for humans, possums are also the most effective at killing the disease-carrying pests. Opossums kill almost every tick that occupies them, the study found. A single opossum kills over 5500 ticks per week. “Opossums are extraordinarily good groomers it turns out – we never would have thought that ahead of time – but they kill the vast majority – more than 95% percent of the ticks that try to feed on them,” disease ecologist Rick Ostfeld explained. Worldwide, more than 1.3 million people die each year of infectious diseases transmitted by a vector, such as a mosquito, sand fly or tick, according to the World Health Organization. Vector-borne diseases also inflict heavy tolls on crops, livestock and wildlife, the study’s authors wrote.